Shaped more like a HUMAN heart than a "Valentine" heart! Cool! Funny. I don't recall ever seeing a heart-shaped rock before. Of course now that I've said that I'll see them everywhere. That sounds like a cool collection. How many do you have? kewl, will look forward to seeing it with your collection you have on that stoop i have seen before. Awesome! I haven't been commenting (teacher, end of the semester rush, you get the picture...), but I have been lurking. Checking your blog definitely makes the day easier! I don't recall ever seeing heart shaped rocks either, but I going to be on the lookout now. 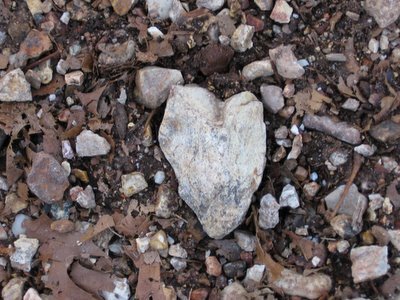 If you're going to collect rocks, heart-shaped ones are probably the nicest. What will you do when you get a whole bunch of them? I just started collecting heart shaped rocks about a year or so ago. Lately, though, I've been finding more and more. Yesterday was a record score: four during my afternoon walk! I think I have about 40 altogether now. Yep, if you click on the links in this photo caption, you can see some older photos of my other heart rocks. The majority of them are lined up on a stone ledge next to the front door to the house. I love seeing them every time I go by. What's really neat is that the colors of the heart rocks match the colors of the stones on the front of the house, as those stones came from the old quarry near our farm. I never really specifically looked for them, it was more like they just kind of started popping out. But now I wonder if I'm subconsciously on the lookout. I sure am finding a lot more. I love all the different shapes and sizes. Let me know if you find some! I also collect other rocks to use around the yard and garden as landscaping (click here to see a photo), but I definitely love my heart rocks the best.